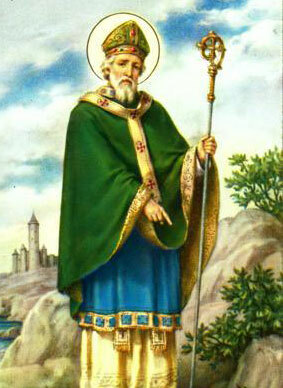 Wherever you are in the world, I hope you are having a wonderful Saint Patrick’s Day! 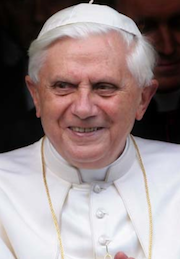 I love that he is the patron saint of the Archdiocese of Melbourne and New York! Let me share this video with you from Busted Halo. Here they are asking people how much they know about Saint Patrick… while they are decked out in green and shamrocks! Now is also the perfect time to share some photos from Ireland! These were taken on my trip there in 1999 – so they were taken on Advantix film and I had them digitized a couple of years ago. I loved Cavan. 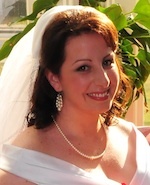 It was in Cavan that I bought my Claddagh ring – that was what we used as my engagement ring. This is a gorgeous view from somewhere in Tipperary. This is where Mark Barrett Cleary lived, before he left Ireland for Australia. If you are interested in listening to some Irish music, I have to recommend Now and In Time To Be. This is one of my favourite CDs of ALL TIME. It is the poetry of Yeats, performed by various artists to music. It is absolutely amazing. One track that I play a little too much is Shane McGowan’s rendition of An Irish Airman Forsees His Death. There is a guy who was on the run from the police who has climbed up to the top of a lamp post. So now, Times Square has been closed while he is coaxed down. Friday night, peak hour… couldn’t happen at a crazier time. I am seriously a ZOMBIE at the moment. Daylight Savings time has knocked me for six. I have previously blogged about how much disdain I have for this time of the year, so again I’ll give a shout out to the End Daylight Savings group. For someone who is SO set in their routine, it really affects me. I feel like I have jet lag so I am hoping an early night tonight will do the trick. 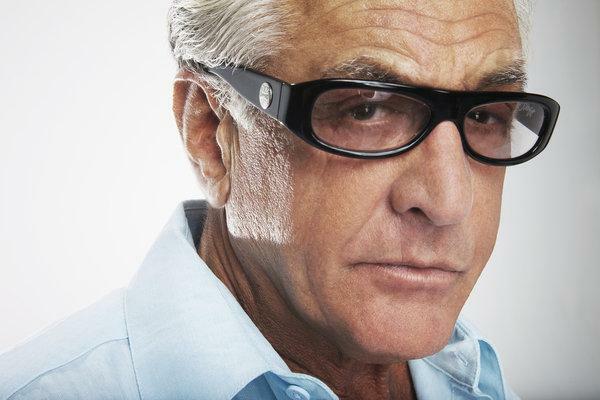 So in lieu of any major kind of blog post, let’s all band together and admire the legend that is – Barry Weiss. For those of you that don’t know, he is the best guy on the awesome show, Storage Wars on A&E. I screamed at tonight’s episode (season 2, episode 1 repeat) as Barry actually went to one of my favourite places – the Rainbow on Sunset Boulevard. I immediately had to email Ev to let him know that Bazza was at our place! This time four years ago, I had my initial Green Card interview in Sydney. Going through the Green Card process as a lottery winner is an emotional and stressful time. Back in the day, I created a blog dedicated to the whole process. Forging the ‘virtual help’ of other winners around the globe is the only way to get through the process so I created it to help future winners and other buddies who were going through it at the time. I have just updated it with some of the posts I made on this blog when I actually got here so now, it is a full chronicle of the process. Just reading through my posts tonight has bought back SO many memories. The stress and drama over the size of passport photos and how every single thing is spelt on multiple forms came right back! It was an unbelievable experience and I am so very very fortunate to have been picked. Some days, I still cannot believe it! There is a huge development going on not far from our place. The building of the Barclays Center. Thus will be the home to the ex New Jersey Nets… they are going to become the Brooklyn Nets and play their home games there. YES! As well as this Andrea Bocelli will be performing his only New York show there in December and Jay-Z, as part owner of The Nets and with an obvious interest in the stadium, will also be performing shows there to open the stadium. I am hoping we will get a lot more concerts there seeing as it is so close. The first basketball game scheduled to be played there will be the University of Maryland Vs Kentucky. 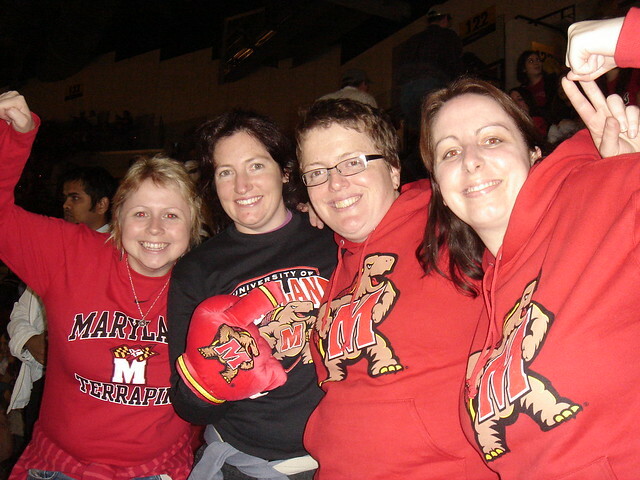 I love the Terps! In 2008 I took part in a study tour when I was finishing my Masters at RMIT and spent two weeks at the University of Maryland studying at the Robert H Smith Business School. It was AWESOME. I wish I could’ve been an exchange student and stayed for a semester. For the Maryland Vs Kentucky game, there was a presale on Saturday and we got tickets! The most awesome thing is we just have to walk or get the bus a few stops home. Goodness knows what the traffic situation is going to be like along Flushing Avenue and Atlantic Avenue whenever there are events there, but I think this is just an awesome addition to Brooklyn! There was one thing I wanted to make sure of when I moved here, and that was to make sure I took advantage of the concerts that come to New York that I missed seeing in Australia. One thing stood in my way, tickets here are very hard to get. It seems everyone wants to see their favorite performer in NYC so getting tickets can end up being a very expensive experience! 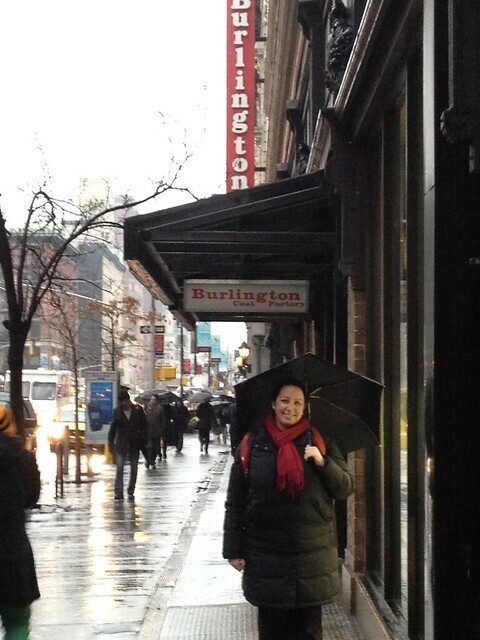 When I saw that Bruce Springsteen was touring here I made sure that was one concert I wanted to see. 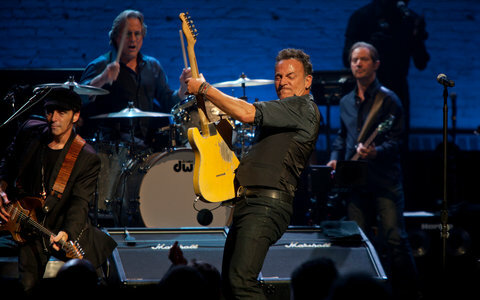 Just imagine – the Boss at Madison Square Garden. YES! I actually survived the Ticketmaster Meltdown of 2012 and somehow, ended up with tickets on the floor to his show. It was so much of a story, they actually had a segment on the evening news about it. Thousands of fans missed out and we got two tickets. When I jumped on Stub Hub after the sale that sold out in seconds, I was shocked to find tickets in our area selling for thousands. I flirted with the idea of selling them… but I have been in that position before where I really really wanted to see someone and missed out on tickets as I couldn’t afford the scalpers rate. But on the otherhand I was thinking “Oh… just IMAGINE what we could do with the money!” Scalping is not illegal here, if you have a ticket you can sell it. It was so tempting. BUT we stuck with our tickets. As Bill and I discussed it – we’re not huge Bruce fans but it will be GREAT to see him. I love his old stuff and I am hoping he will play some of that but also, his new album Wrecking Ball is getting great reviews. So I think we’ll be in for a good night. Just check out this photo from his special SiriusXM show from the Apollo Theatre the other night… The Boss still has it going on that is for sure! I am writing this at 10.10am. Last night I was on the phone to mum, dad and Ev from about 7.30pm to 9.30pm. At 9.40pm I fell sound asleep. That sound woke me up at 3.30am, 3.40am, 3.50am… this went on until 6am when I gave up and tossed and turned enough that I woke Bill up. Then, I decided to call mum and dad (only people that I know that would be awake!) to rant to them about the alarm. At 7am I decided I should do the housework that I skipped last night as I fell asleep early. So I was up scrubbing down the bathroom and toilet at 7am. At 7.30am it was time to sort the laundry. Bill took it down to the laundry at 8am. We had breakfast while we watched some Lindsey Buckingham on Palladia. I sorted through the mail from last night. Dishes were put away, bed was made, then at 9.10am our building super was up to change our kitchen lightbulbs and deal with our bathtub blockage… of my hair. Even though we use a drain guard and everything. Ugh to living in old buildings! In the meantime, Bill had put the washing in the dryer, I did some online banking. Bill also took the trash and recycling down to the basement. Then it was time to fold and put the washing away. I did this while watching the Thursday episode of Days of our Lives. I then did some work for Queen of All Saints. My big clog of hair was discovered at about 9.50am and at 10am I was back, scrubbing the bath down again from all the dirt and mess that was made. And now – Bill is baking bread while I am doing this. That alarm? Apparently it is from the door that gives access to the roof. Someone was up there last night and it has only just stopped blaring. I think there will definitely be a nap in order this afternoon! 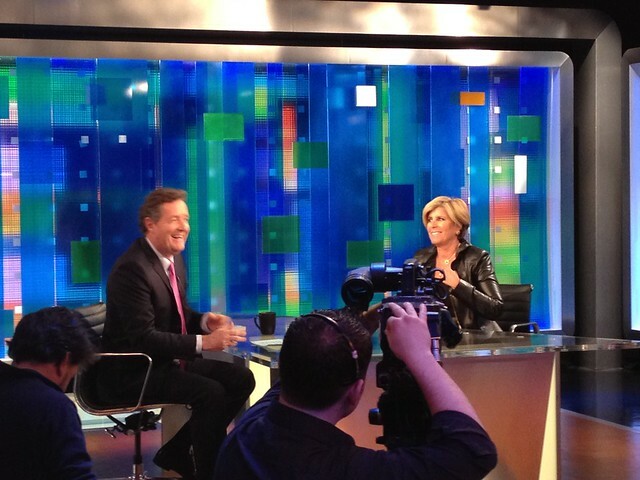 A few weeks ago I found out Suze Orman was going to be on Piers Morgan Tonight – with a studio audience! So I couldn’t help myself and I managed to get Bill and I in to the audience. I was so excited. I submitted a random question about home ownership but didn’t get picked to ask a question but that was ok – we were just happy to be there. We started out first off, going to Steak ‘n Shake. I had been so excited to check this out beacuse I had only ever heard about them when people would talk about the best fast food in the Midwest – so I was sold. 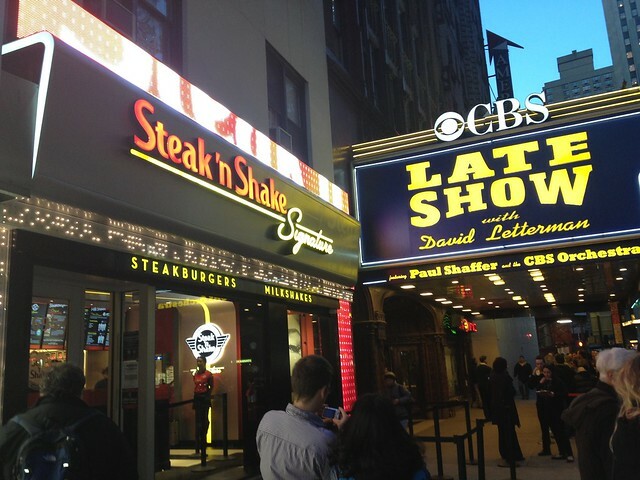 They are located right next door to the Letterman theatre and the night we were there just happened to be his 30th anniversary show. 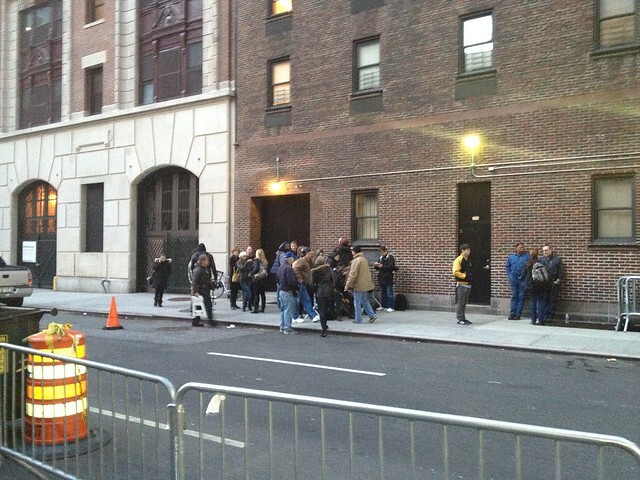 Howard Stern was a guest and here was the paparazzi at the side of the theatre waiting for him. I actually managed to see the Late Show back in 2005 – on our show we had Brittany Murphy as a guest and the John Butler Trio. 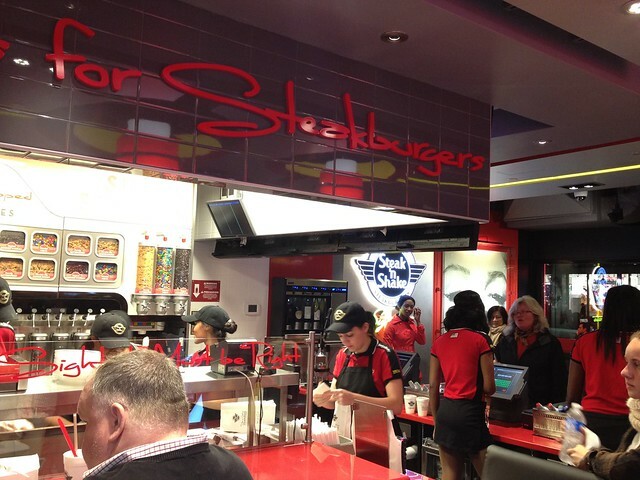 Anyway, back to Steak ‘n Shake. I loved it. Only downfall? Lack of seating! We lucked out and got two seats right where the burgers are being made.. but if we didn’t score them we would’ve been eating our burgers standing outside. We got their basic steakburger, fries, a shake to share and coke. They have implemented one of those amazing soda machines that we saw at the movies so it was great to use it. I really really liked everything there. 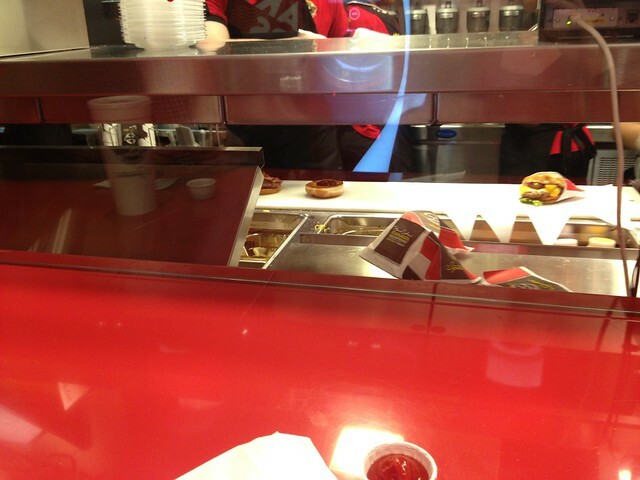 I love the super thin fries… Bill not so much. 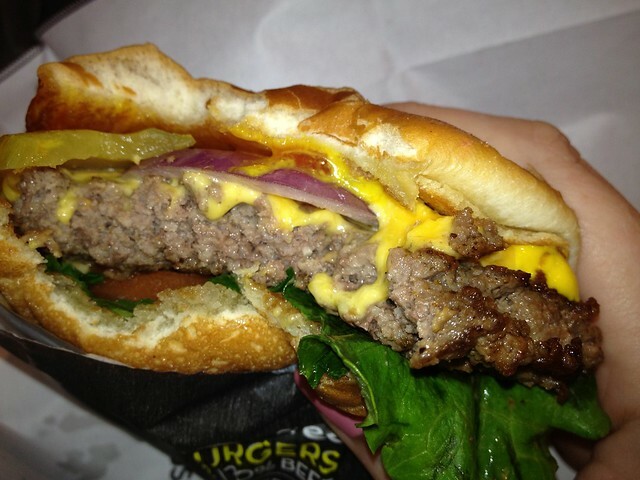 The burger was juicy and I loved the pickle spears rather than discs. 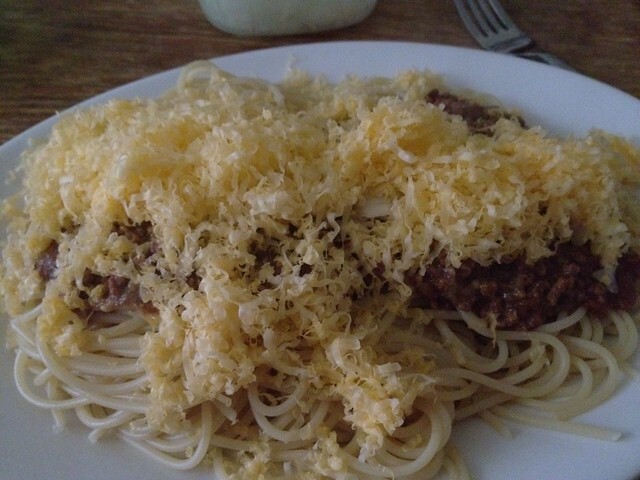 All in all, it was delicious! The shake was really nice and they make them all at their shake bar. 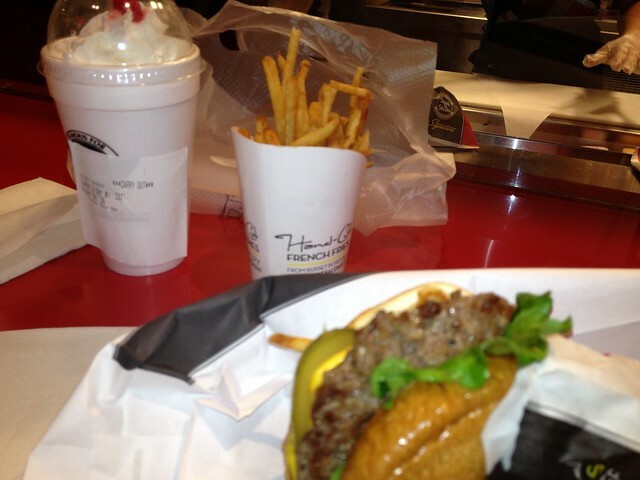 The other thing, it wasn’t Shake Shack prices.. so that was nice as well! We then wandered up to Columbus Circle and had a “I want this in our kitchen…” shopping experience at Williams Sonoma. 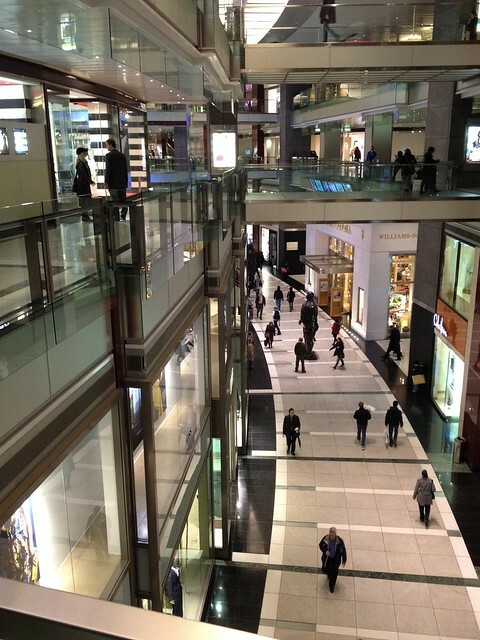 It is so strange without Borders being in Columbus Circle – it is really sad and it feels so empty. 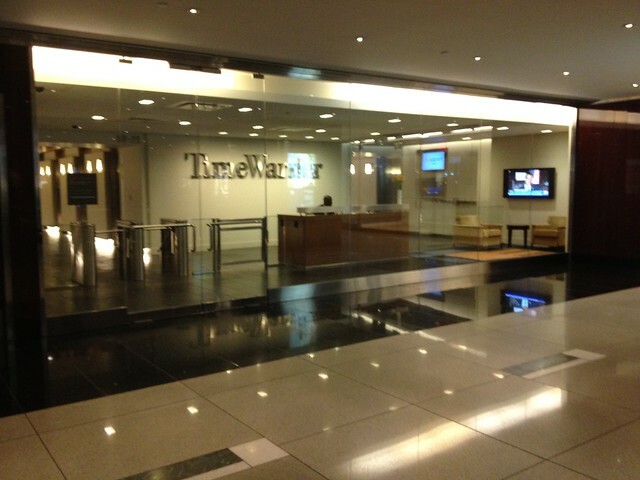 So after some wandering, we then headed into CNN to line up for Piers Morgan. Line is the operative word. They didn’t have seats or anything and just had to stand in this bare corridor for over an hour. I know they don’t specialize in studio audiences but they need to take a leaf out of Martha Stewart’s book and learn how to organize an audience. There wasn’t many of us so some chairs wouldn’t have been an issue! While we were in the corridor they had a camera man go past and they asked us just all to ask some random questions into the camera so that was kind of strange. 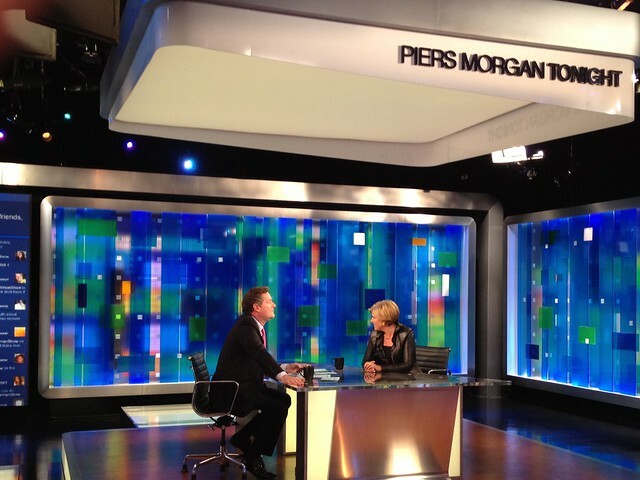 I was over tired and grumpy by the time we got called into the studio – but that soon disappeared when we saw how intimate the set was, how personable Piers is and then… Suze! The show was live so as the introduction was aired… oh my gosh… there was Bill and I beaming across the world with me asking my question to the camera! When we left, we got a free copy of Suze’s Book ‘The Money Class’ and we got our weary selves into a cab and straight home to watch how we looked on TV. 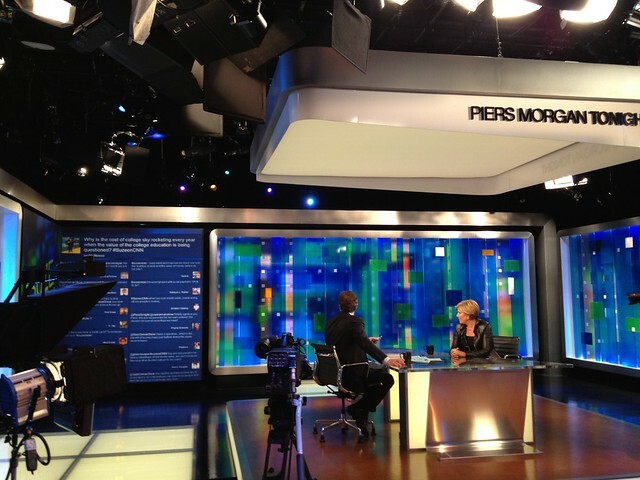 It is SO bizarre watching yourself on HD TV… but so much fun too. It was a great way to spend a weeknight! I haven’t been to Ohio – yet. I cannot wait to go sometime soon – it is the one state that I am kind of obsessed with. Note – Bill was actually born in Ohio! It has been one of those places that I have always dreamed of going. When I won the Green Card I always thought that if I managed to get a dream job in Ohio, I’d go there for sure. No questions asked. 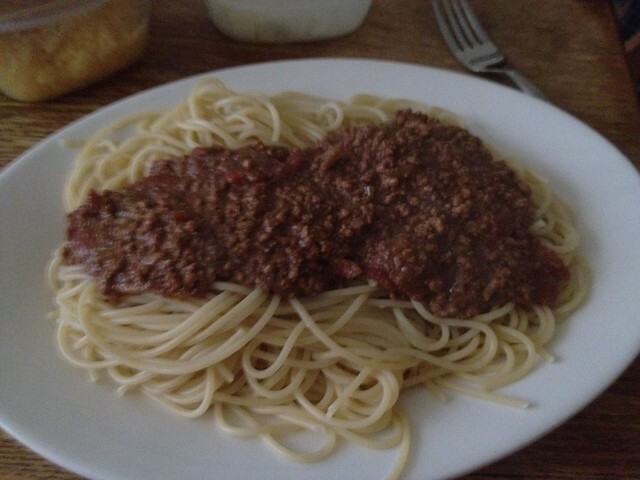 I’ve also seen Skyline Chili on Diners, Drive-ins and Dives and knew I just had to try this meal. If we couldn’t go to Ohio, we’d bring Ohio to us! When I was working our our meal plan for this week, I suggested Bill make Skyline Chili for our Sunday meal where we could eat meat. Mission was set and he found a recipe to try. 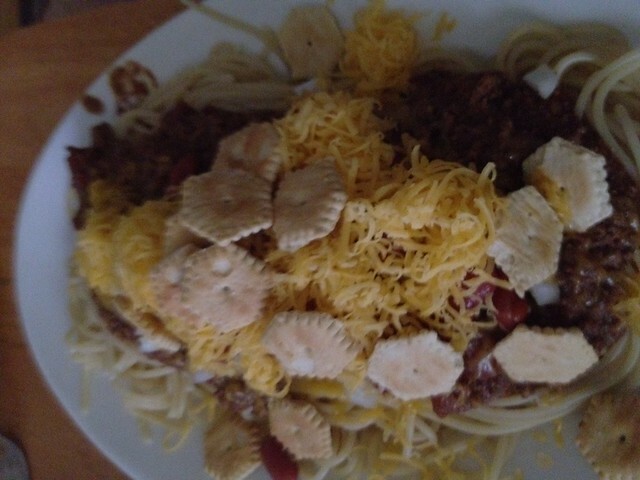 He used the About.com Skyline Chili recipe and the apartment smelt amazing while it was cooking! You can see in the recipe, it has some pretty interesting ingredients. When I took my first taste I realized I vaguely knew the flavor – from pastitsio – the Greek pasta dish. 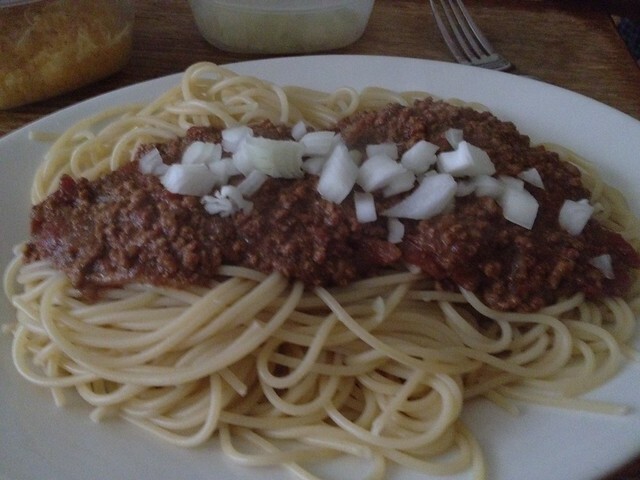 It is very similar to the meat sauce used in that and then, I found out that the owner of Skyline Chili is Greek – so you can definitely taste that influence. This is an AWESOME dish – especially during winter! This was such a great Sunday lunch. I cannot wait until the next time we have Skyline Chili where we will hopefully actually be in Cincinnati! NPR Ask Me Another – Live! 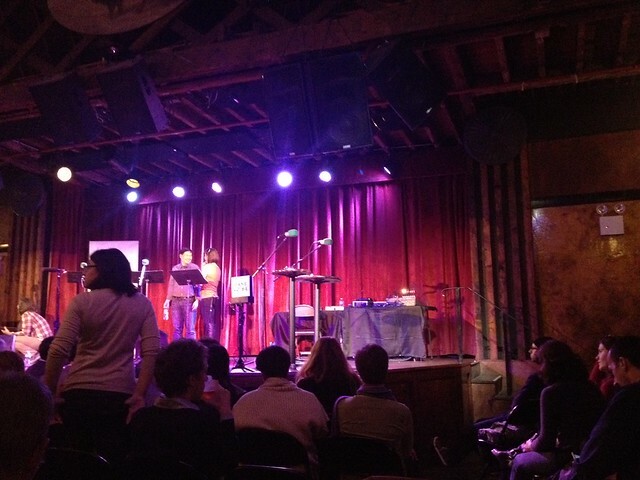 On Wednesday, we went to the Bell House in Brooklyn for the taping of Ask Me Another for NPR. This bought back memories of seeing This American Life a few years ago at the Clearview in Chelsea. Bill and I are both radio nuts. I could quite happily live with my radio going 24/7 and seeing a live radio production really is fun. We grabbed some dinner and then jumped back on the train to Brooklyn. 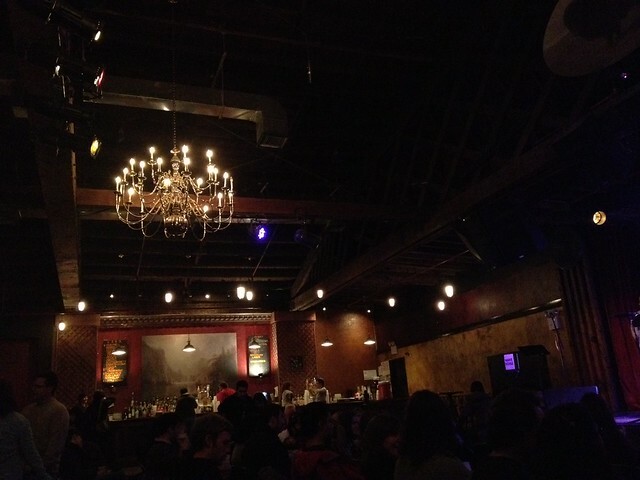 I have never been to the Bell House before but they do have a bit of an Australian connection as they have held Australian music showcases before and they do serve DUB Pies. As we are abstaining from meat, that wasn’t an option tonight. Boooo! Walking into the back room I got pangs of homesickness for the Espy… you can see why! We got into our seats and waited for the show to start – it isn’t bad but I feel they could maybe make the show a bit shorter or have more of a mix of quizzes to save the feeling that of dragging on. It was all very intimate for a live show and even being surrounded by an overload of hipsters, it looked like we would have a good night. I was feeling some serious Rockwiz vibes while we were waiting for it to start! Unfortunately we had a rude couple behind us who were just muttering between themselves throughout the show. I only wish that as well as telling everyone to turn their phones off, places like this would say “If you want to have a conversation – go outside!” It is SO annoying and was really distracting. The girl kept doing this brainless giggle at things that weren’t even funny and it was wearing thin very quickly, especially when we were trying to listen to the questions and answers. 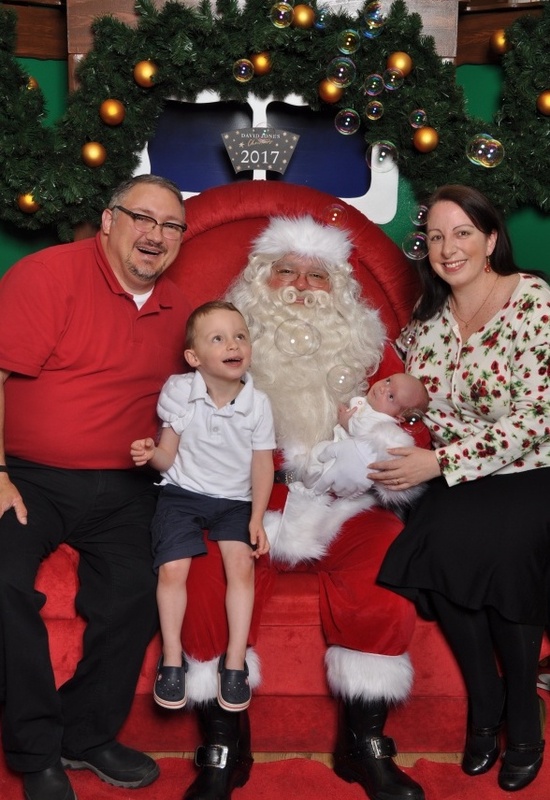 I ended up turning around and saying “Shhhh!” to which the girl did a gesture over my head like “Tut, Tut!” I didn’t see it, but Bill did… so then he turned around and said “Do you MIND not disrespecting my WIFE?” (I still blush when I hear ‘wife’!) They tried to act all very much “What are you talking about man?” they were just so rude! Bill told them to just go somewhere else if they wanted to talk, as they hadn’t stopped all night! They finally moved away but the mood was definitely killed for us to be able to enjoy the show. We left early with about 15 minutes to go as we weren’t that passionate about hanging around to find out who won anyway. Not too bad for a free night out in miserable weather but what is it with people in audiences just being so annoying lately?! Ugh!